As your personal data are protected in a special way, it is of great importance to us to comply with every guideline, which is made by law. Personal data are particulars about personal and factual relations of a certain or definable natural person. Especially name, address, date of birth as well as telephone and telefax number belong to the personal information of a person. In the following we are going to inform you about the data, which are collected by us at your visit on our website, to ensure the maximum of protection regarding to the law. If there is any exploit of the collected data it will be presented in the following, too. As written in the German Data Protection Act (GDPA) and in the telecommunication media act (TMA) we are up to use, process and record your personal data to process requests and perhaps to process orders or agreements. The use of your data for advanced function is under the exception of your explicit agreement. The use of those data is anonym and for statistical requirements. The data which are collected by reservations, contact or any other forms that are filled by you, will be used by us to answer the form’s requests. In a period of six months after editing, the data will be deleted. They will not be deleted though, if there are any more duties of keeping. Your data will only be used to achieve our contractual obligation and to guarantee a smooth flow, especially to carry out a contract. If necessary we give the data to a third person or they will be recorded if it is necessary because of any other lawful reason. The data will only be used for propose that you specified at your data input and will be used for the propose that you agreed with. Your data will only be recorded as long as it is necessary, to comply our contractual duties or rather to comply its propose or as long it is necessary by law. The use of a contract’s data is necessary, too, if it is collected to keep our interests by credit reports. Such a credit report demands a transfer of personal data to a third person and provides information, with what probability a default threatens. Values of probability could be included, that are calculated by a scientific basic and among others, the data of address is used for that calculation. Values of probability are called score-values. There is no other transfer of your personal data to a third person, than those which are named in that paragraph „2. Use of the collected data“. You do have the right, to get advice about your recorded data, at every place, that collect data to get credit reports. Cookies/ text fails, which are recorded on your computer, are used on our homepage. Permanent cookies recognise, that your pc has already had a connection to a web offer; session cookies record latest watched offers. Third persons, especially our partner companies are not allowed to get, to use or to process with your personal information by cookies through our website. Session cookies will be deleted as soon as the session is closed. There are no disadvantages for you, by the application of the kind of cookies that we decided to use. You can agree or disagree to the record of cookies in the settings of your browser. We use google – analytics, which is a web analytic service, provided by Google Inc. The information, which are created by the cookie, are usually transferred to google-servers, which are settled in the USA to record data. Google is up to use those information, to exploit your use of the website, to create a diagram of your website’s usage and to effect more attendance to the webmaster. Your IP-address, which is transferred by your browser, will be merged by google with other data. 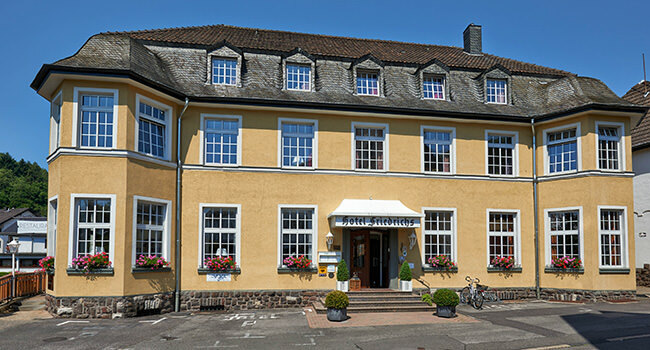 A given agreement of charging, processing and recording can always be revoked by writing an e-mail to mail@hotel-friedrichs.de or by calling +49 24 44 950 950. Your personal data are recorded in such a technical and economic possible way, that third person’s access to your data is prevented. Still we cannot guarantee a complete data security and privacy by e-mail communication. We use maps of “Google Maps” powered by Google LLC, 1600 Amphitheatre Parkway, Mountain View, CA 94043, USA.